World Wrestling Entertainment Kids. Stamford, CT: World Wrestling Entertainment , Inc., October 2010. Print. I don't know about you, but I get asked all the time for help by kids looking for pictures of - or books about - their favorite professional wrestlers. The latter is often hard to come by, however, as there are a limited number of such titles and because celebrities often come and go quickly. Much of the information that is available, both in print and online, tends to be aimed at an older audience. Which often creates issues of not only accessibility it terms of reading level, but also appropriateness in terms of content. So, despite my personal feelings on the sport, I was rather intrigued to find a WWE publication that was clearly aimed at a tween audience. WWE Kids does make attempts to be educational - inserting an article full of space facts, for instance - but it's greatest strength lies in it's high interest content and vibrant and glossy presentation. Much of the magazine is intended to look almost like a scrapbook, but it's clearly well designed and stylized. Like the sport it covers, it's full of drama and energy and should appeal to a large number of otherwise reluctant boy readers. 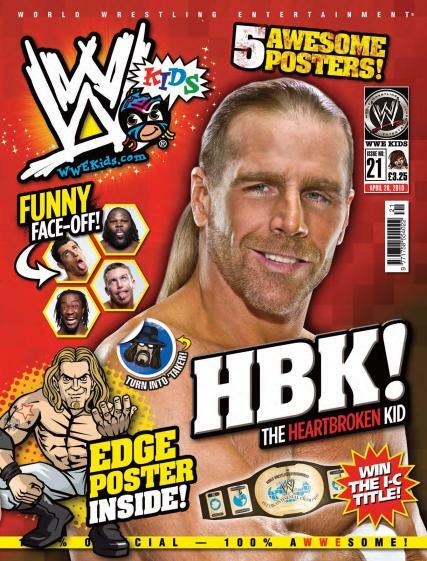 One potential problem, however, is that this is a magazine put out by the same company who runs the wrestling events. This normally shouldn't provide any more conflict of interest than Nickelodeon Magazine, American Girl, or Disney Magazine - except for the conceit that the WWE is a sport and not a show. Clearly this is a useful magazine for getting kids to pick up print materials when they would otherwise rarely do so. While it may be difficult to find other wrestling materials to display with the magazine in order to entice readers to expand beyond the periodical, one might be able to tie in titles that relate back to the educational or craft sections within each issue. In fact, using the craft section of an issue of WWE to advertise a tween craft could help encourage more boys to become involved and feel moew welcome in the library overall.